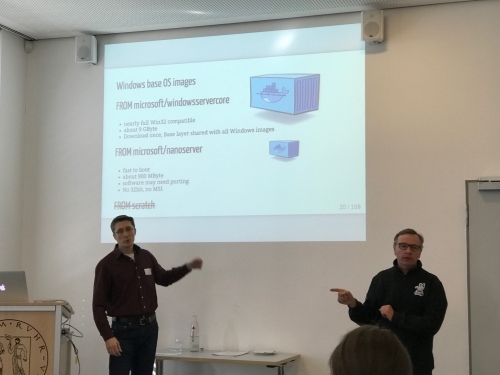 For the DevOps Gathering - a conference about DevOps, Docker, Kubernetes, Microservices and so on - I prepared a workshop to get started with Docker on Windows Server 2016. More and more people are attracted by the new way to deploy and run services with Docker and native Windows containers. 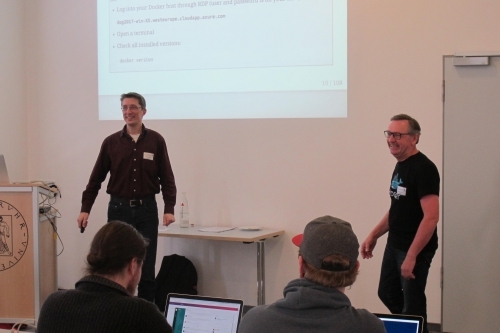 In this three hour hands-on workshop the attendees had the chance to get a deep understanding what containers are, how to build an Docker images, where to find images on the Docker Hub, how to write good Dockerfiles for Windows and how to persist data using volumes. It was my first workshop of this kind and so I hoped that WiFi works well for the workshop. I provided plenty Windows Server 2016 machines in Microsoft Azure Cloud and the attendees used RDP to connect to these machines. With this setup nobody had to setup local VM’s and it was easy to run the workshop. Even working from a tablet worked quite well. Even Docker experts on Linux learned some small tricks that apply for both the Linux and Windows platform. They also were astonished how good the Docker support on Windows has evolved. Most of the features that you will use in a Dockerfile or a docker-compose.yml are also implemented on Windows. So deploying and running containers look pretty much the same.